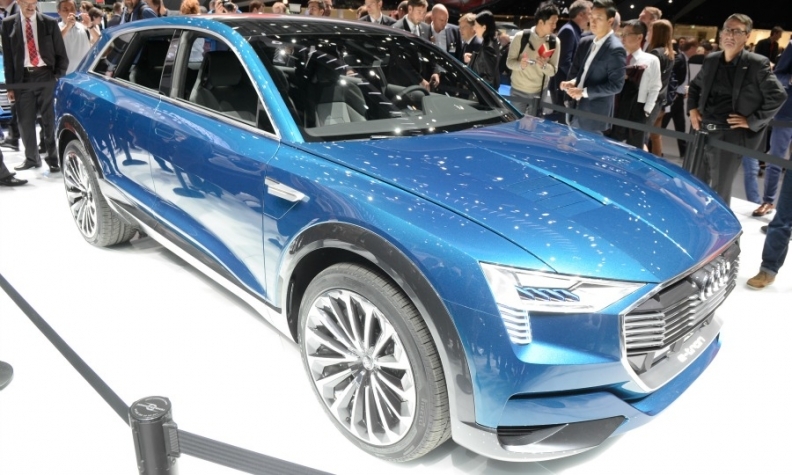 The e-tron quattro SUV concept was first shown at the 2015 Frankfurt auto show. INGOLSTADT, Germany -- Audi offered more details of its plans to launch three full-electric cars by 2020 as its CEO Rupert Stadler outlined the automaker's plans to make EVs a "must have." The first will be the e-tron SUV, which will go on sale next year. The Tesla Model X fighter was previewed by the e-tron quattro concept first shown at the 2015 Frankfurt auto show. The car will have a range of 500km (311 miles), Stadler said at the company's annual earnings conference on Wednesday. The second EV will be called the e-tron Sportback and will follow in 2019. The car will be a fastback model sitting lower than an SUV but offering a more elevated driving position than a standard hatchback, Stadler said. The third EV will be compact model built on VW Group's MEB new electric cars platform. It will launch in 2020, shortly after Volkswagen brand's version based on VW's I.D. compact hatchback unveiled at the Paris auto show last year. After 2020 Audi will add an EV version in each of its core model series. They will be differentiated from standard cars with a recognizable design. Electrification is a trend that's not only limited to one model, Stadler said. "There will be three battery electric vehicles by 2020 and in the following years more pure electric models will be added," he said. A third of all Audi sales will be either partially or fully electric by the middle of the next decade, Stadler predicted. "We will make the electric car into a 'must have' in the coming decade," he said. Stadler's comments confirm earlier reports that Audi aims to have three electric models by 2020 as it focuses more resources on electric cars, digital services and autonomous driving. Stadler said the automaker will launch more plug-in hybrid models. The company is about to start production of a plug-in hybrid version of the Q5 SUV in Mexico and last year launched an A6L e-tron plug-in hybrid sedan in China. Audi will pay for its push into electrification by reducing the number of transmissions, body-style variations and conventional engines by 40 percent. "We will reduce complexity from the system and will free up resources for the electric drive systems of the future," Stadler said.